If your computer comes with a built-in wireless adapter but you need to use a new external wireless adapter, you have to disable your built-in wireless adapter first to prevent conflicts on your network connection. 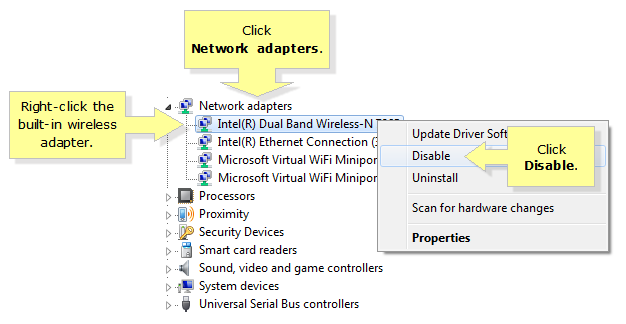 This article will show you how to disable the wireless adapter on your Windows computer. NOTE: In this example, the Windows Vista/7 operating system is used. Right-click on Computer then, select Properties. Click the Network adapters category and right-click on the model number of your built-in wireless adapter. Then, click Disable. Your wireless adapter should now be disabled.